Emergency Response Training Ltd was established in 2002 with the sole purpose of providing high quality, cost effective, sector appropriate training. In 2016 we diversified into three divisions and increased our portfolio to include a full complimentary one-stop service for businesses. 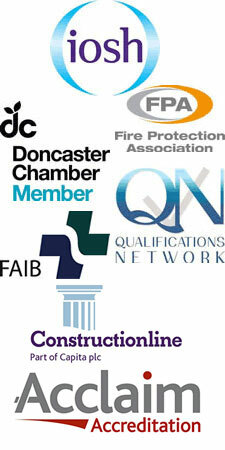 Our vision now is to be South Yorkshire’s leading provider in high quality health & safety training, fire safety services and safety products with the aim of providing our clients the best possible customer service and significantly improving our customer’s experience by offering a total safety service. The training service that ER Training delivers across the UK is facilitated by highly experienced approved trainers with a wealth of experience in their particular field of expertise. All the training we provide is approved or accredited ensuring our clients receive the highest possible standards incorporating the latest theory, techniques and practical elements. Our training is very thorough but we also aim to ensure our students enjoy the experience of learning. Emergency Response Training is pleased to announce it achieved runner-up position in the prestigious Doncaster Chamber 2014 business awards for “Excellence in Customer Service”. Our approved courses can be provided ‘on site’ at your location when and where you want, locally or on a National basis. Courses can also be adapted or written to accommodate individual company environments and risks. These 2 hour modules are all CPD Approved and designed to meet practice’s working patterns, encourage staff development and meet specific CPD requirements. We offer a range of courses specifically designed for schools and colleges catering for both staff or students. Large or small groups, split courses or twilight sessions are also available. Creating effective teams in challenging organisations Get the best from your staff through enjoyable learning, motivation and personal reward.